One Way To Pluto! — Locked In The Attic Productions! 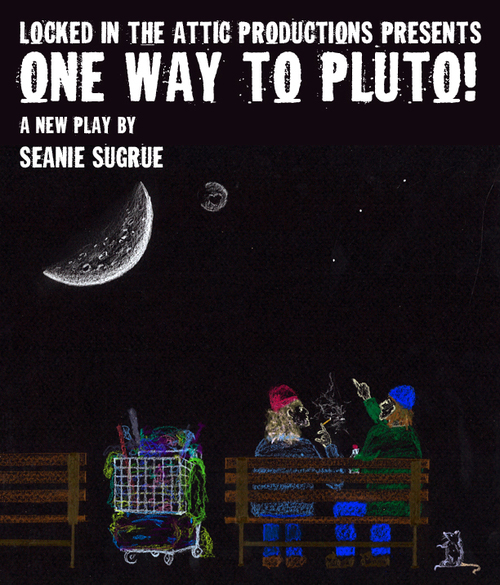 One Way To Pluto!, the prequel to Black Me Out!, is an existential journey through the life of Peter Cooper, a hostile persona struggling to make sense of his transgender dysphoria. Falling out of grace with everyone around him, Peter plunges from shared housing to homelessness, seldom user to heroin junkie and from punk rock drummer to pathetic, washed-up rock star. Destroyed by his ego, comfort comes through a psychedelic journey to Pluto and back with Dwight, a chronic vagabond, and from an act of criminal desperateness, he befriends one of Pluto’s moons. This story is a restless exploration of one mans search to find meaning and delves into the fight against personal delusion, addiction, and the trepidation of inferiority. The production of One Way To Pluto! featured soundtrack music from East Village band Acquiesce! Like them on Facebook or visit their homepage!